The VWR Ultra low Temp -86c Freezer 5670 provides mid-level monitoring and storage of your ultra-low temp samples. This lab freezer has a 28-cu ft. capacity with 4 compartments, each with its own high impact ABS plastic door to help reduce temperature loss. This microprocessor controlled ultra-low temperature freezer has a bright easy to read LED screen from which users can set temperatures in 1°C increments, monitor system health, and silence alarms. 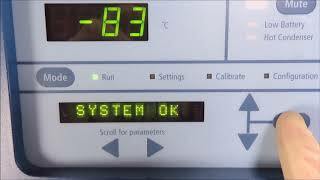 This ULT Freezer continuously monitors the system and reports back, and alerts users to deviations in temperature or power failure with audible and visual alarms, as well as when to clean the filter, if the alarm battery is low or if there’s a voltage problem. This -86 freezer has a stainless interior for easy cleaning with a powder coated exterior that resists corrosion. Sandwiched between the cabinet and exterior walls or this lab freezer is 5 inches of foamed in place insulation for excellent temperature control. The door for this ultra-low temperature freezer has a vacuum port to help with pressure equalization, with easy one handed operation for quick openings, and a lockable handle. This VWR 5607 Ultra low Temp -80°C Freezer has been fully inspected and comes with current validation reports. All of our lab equipment comes backed with our standard warranty. Should you have any questions, please don't hesitate to contact us.